Nice variety. Everything I order is always so so good. From Amy Honigman of Oakland, California on 5/15/2018 . I sent the Variety Pack to my daughter for her graduation weekend. She and her friends inhaled it as soon as she received it. Didn't even make it to the weekend! Hahn's is the best! From Meghan OCallaghan of TARRYTOWN, New York on 4/4/2018 . I sent the variety pack to my in-laws in Florida and they loved it. They want to order more as soon as they finish what they have. Thank you! From Jeffrey Petty of Mesa, Arizona on 12/20/2017 . Excellent service and outstanding quality, as always. A great selection of homemade cakes - a perfect gift. From Sue Stanley of Glendale, Arizona on 11/26/2017 . From J K of Wantagh, New York on 11/22/2017 . From Anonymous of BETHPAGE, New York on 11/21/2017 . Hahns bakery has the best crumb cake we have ever eaten. We are a business and sent a few cakes to our clients and they LOVED it! From Kathryn Morse of New York, New York on 9/6/2017 . From Joseph Rotolo of Murrieta, California on 7/31/2017 . I moved to California from New York. Cant fine a decent crumbcake. Thank goodness for Hahn's. The BEST. From May Saubier of Slingerlands, New York on 5/8/2017 . I sent the variety pack as a sympathy gift and it arrived on time and people said it was delicious. Over the years, I have sent these cakes for many different occasions and they are always a big hit. From Anna Maria Pittella of Red Bank, New Jersey on 4/12/2017 . Gave it to my client who shared it with family over the holidays and it made a big hit! From Anonymous of Homasassa, Florida on 3/30/2017 . Recipient of the gift was thrilled and enjoyed every crumb! From Joseph Fazio of Cliffside park, New Jersey on 3/5/2017 . From mary shear of jackson, New Jersey on 2/26/2017 . Wonderful. Sent to my Brother and he loved it. From Christina H of Bronx, New York on 12/28/2016 . I'm the biggest critic when it comes to cakes - I've tried them all BUT this is by far the best crumb cake I've ever tasted ! From Sue Tringali of Front Royal, Virginia on 12/24/2016 . Many thanks for the replacement variety pack to correct the all crumb cake. It was above and beyond and delicious! Hope we can freeze some of it. From Judi of California, Maryland on 11/27/2016 . This is the second time we ordered the Variety Pack for Thanksgiving! I also sent this website to two of my friends and they ordered and loved it as well. One got the classic and the other the Variety Pack. Does not disappoint. You'll love it!! From Nancy Kostoff of East Stroudsburg , Pennsylvania on 10/19/2016 . This was the best crumb I have ever had. I will be ordering more for myself and gifts for friends. From Mary Cahill of Boca Raton, Florida on 9/6/2016 . Best I've ever tasted. Worth the price. From Jean Brennan of West islip, New York on 7/14/2016 . Perfect choice for a friend or relative who grew up on Long Island & has moved away. This little taste of home was delivered exactly the date I requested. Trust me when I say it was gone in short time! From Anonymous of Monticello, New York on 4/18/2016 . Receiver of "Variety Pack" - gift raved about the taste and quality of the product. Will be purchasing additional products in the near future. From Delores Hahn of Genoa, Ohio on 3/23/2016 . From N. Gonyon of Port St Lucie, Florida on 3/23/2016 . I absolutely love this variety pack. All 3 varieties are delicious. In the past I've only ordered the original which brought back memories of my grandfather, aunts, uncles, and cousins in Queens and Middle Village. Good times. I think the only thing that would make this variety pack better would be more flavors! Apple, caramel, blueberry, and cherry, etc. Just saying. But whatever flavor your cakes come in I'll definitely be placing more orders. And next time I won't order so far ahead of when I actually need it. I keep slicing small pieces off, so I hope I have enough left. (Only 6 days to go. It's not looking good). ;-) Thank you Hahn's!! From Anonymous of California, Maryland on 12/27/2015 . Having grown up on Long Island with frequent trips to NYC, the bar was set for crumb cake expectations. Hahns crushed it. CC was awesome! We will be repeat customers. From Anonymous of Valley City, Ohio on 12/23/2015 . Recipient raved and said it was the perfect gift! I will send this whenever I need a gift for someone special! From BRIAN HOLIHAN SR. of PORTLAND, Maine on 12/21/2015 . and our family on Sunday morning after Church. what a surprise! From Debra Simeone of Waldwick, New Jersey on 12/20/2015 . I sent three for Christmas and every family loved them, will definitely use again next year. Great gift for anyone who loves crumb cake. From Natalie Tchernovitz of Merrick, New York on 12/16/2015 . I sent it as a gift & they called to say they loved it. To me that means 5 stars. I will definitely keep you in mind for future gifts. From Anonymous of Cape May, New Jersey on 11/16/2015 . Received this as a gift. It was so good I had to order more to give as gifts. From Joe Sheehan of Easton, Maryland on 12/22/2014 . I gave seven people this for a holiday gift. Everyone loved it. From Delores Hahn of Genoa, Ohio on 12/21/2014 . From Anonymous of San Diego, California on 12/18/2014 . Fabulous coffeecake--a perfect gift to ship for the holidays. Rich, moist and full of flavor. From Nancy Lick of Laramie, Wyoming on 12/8/2014 . My parents' best friends owned a German bakery in New Jersey and, among other things, made the best crumb cake. This is as close as I can get living in Wyoming -- it is fresh, it freezes well, and it's just darn good. I thought I was a purist until I tried the chocolate and raspberry -- all three types are wonderful. From Anonymous of Lido beach, New York on 11/14/2014 . Gave this as a gift. Recipients enjoyed the variety, but liked the chocolate best. From Anonymous of Center Moriches, New York on 7/2/2014 . I am the 'Sunshine Lady' in our organization and am responsible for sending get well gifts to members. I have had Hahns crumbcake myself and am now sending it instead of flowers. The response is overwhelmingly positive! From Dave of Ellenville, New York on 6/15/2014 . The Crumb Cake was Delicious and very fresh when we received it. 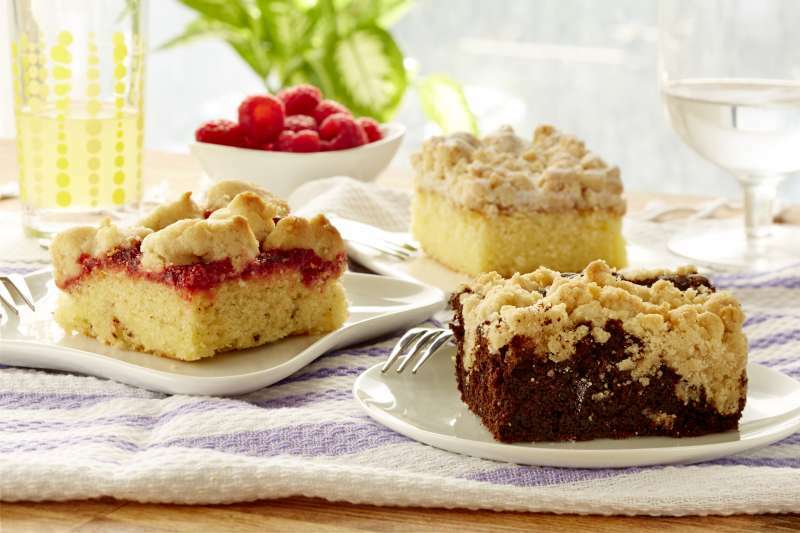 The variety tray which featured plain crumb, chocolate crumb and strawberry crumb cake allowed my whole family enjoyed the wholesome, home baked taste that you just don’t fine in most bakeries. If you like crumb cake then get your hands on a Hahn Old Fashioned Crumb Cake. You’ll be glad you did! From Dawn of Oak Creek, Wisconsin on 4/10/2014 . From Anonymous of Henderson, North Carolina on 3/25/2014 . This is by far one of the best crumb cakes i have tasted in a long time. I will be visiting to order more in the future. Thinking of getting them for gifts, i know my family would love the cake. From Anonymous of South Salem, , New York on 1/20/2014 . My dad LOVES your crumb cake. I like to send the variety pack so he can taste them all. They also freeze well and ship beautifully. From Jerry Liguori of wantagh, New York on 1/13/2014 . Sent the sampler to my sister for her birthday they loved it . She told me it tasted like it just came out of the oven.I will be sending this to all my friends! From Mike D of New York, New York on 1/13/2014 . Great service, Great product. We sent to family in Texas and was told what a big hit it was and how they can't stop eating it. From Cindy Doty of Margate, Florida on 11/25/2013 . I used to live in Levittown NY and ate this mouth watering crumb cakes. I had tried them all and there just amazing. Now i live in Florida and I order every year online for the holidays. From Harry Bond of Flanders, New Jersey on 11/21/2013 . My children really enjoyed the variety crumb pack. I had to hide it to make sure I got some. We will be ordering soon again. From joseph lepus of norwalk, Connecticut on 10/22/2013 . Very pleased with your product. Thank you.